Sunday June 6th 1920 I fixed some of my plants. The girls prepared dinner and they took The Gibbs for a ride and picnic. I got me some dinner. Wrote a little and rested awhile. I then went down to Otts for a call. The folks got home before supper to bed early. 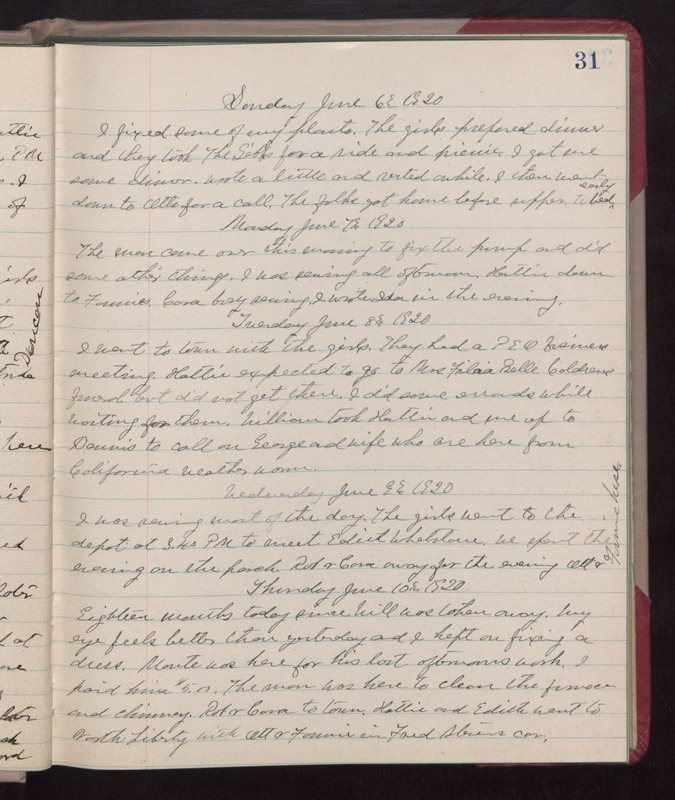 Monday June 7th 1920 The men came over this morning to fix the pump and did some other things. I was sewing all afternoon. Hattie down to Fannies. Cora busy sewing. I wrote Ida in the evening. Tuesday June 8th 1920 I went to town with the girls. They had a P E O business meeting. Hattie expected to go to Mrs Filia Belle Coldrens funeral but did not get there. I did some errands while waiting for them. William took Hattie and me up to Dennis to call on George and wife who are here from California. weather warm. Wednesday June 9th 1920 I was sewing most of the day. The girls went to the depot at 3.40 PM to meet Edith Whetstone. We spent the evening on the porch. Rob & Cora away for the evening. Ott & Fannie here. Thursday June 10th 1920 Eighteen months today since Will was taken away. My eye feels better than yesterday and I kept on fixing a dress. Monte was here for his last afternoons work. I paid him $5.00. The man was here to clean the furnace and chimney. Rob & Cora to town. Hattie and Edith went to North Liberty with Ott & Fannie in Fred Stevens car.